One of the very first recipes I created was a take on this bulgur vegetarian chili. My mother had told me about one of her favorite recipes: a bulgur chili. She had made it a couple decades ago, with chocolate and a few other ingredients, but had since lost the recipe. At first, my attempts at bulgur chili were born out of a desire to recreate her favorite chili. Since then, the recipe has morphed quite a bit. Specifically, the biggest change has been the texture. I don’t like big chunks of anything in my chili. While I’ve made sweet potato/butternut squash versions, they aren’t my favorite. Generally, I keep my chili simple and let the bulgur be the star. A hearty, vegetarian chili that is the perfect replacement for the meat-based version. Bulgur provides the heft and pairs well with the chili spices. Chop the onion, garlic, and jalapeno into large chunks. Place in a food processor and pulse until everything is minced. Drain any liquid that may have formed. Heat a stockpot over medium heat. Add olive oil and onion mixture. Cook until onions are fragrant and transparent, 5 to 6 minutes. Meanwhile, chop the parsnip into large chunks and pulse in the food processor until the pieces are the same size as the bulgur. Transfer to the pot with the onions. Stir in the bulgur and spices, cooking for 1 to 2 minutes or until you can smell the spices. Add in the tomatoes, chocolate, and 2 1/2 cups of the vegetable broth. Bring to a boil, reduce to a simmer, cover, and let cook for 10 minutes. After 10 minutes, stir in the kidney beans, cover, and cook for another 10 to 15 minutes. Bulgur should be tender. Taste and adjust the salt/seasoning. Add more vegetable broth if a thinner consistency is desired. 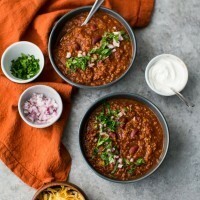 Tips and Tricks: This recipe makes quite a bit of chili but the leftovers freeze well. I like to make a double batch, freeze, and eat for a month. The spices can be played with a bit. I’ll add extra as I like a lot of seasoning but the most import thing here is the salt. Add enough that it bolsters the spices. Too little salt and it just tastes like tomato soup. I like my chili to have a thicker consistency so I typically use less broth. Start with the 2 1/2 cups and check occasionally to make sure the mixture isn’t too thick. One of the main reasons I like this recipe is because it serves as a hearty base. There’s no “main” ingredient because the bulgur isn’t big on flavor. In contrast, it’s all about the texture. Also, the parsnip/chocolate might seem strange at first. But the parsnip helps to offset the heat while the chocolate is more about adding one more layer. Vegetables: While I don’t like large chunks in my chili, I have added sweet potato or butternut squash to this recipe. Add 1/4″ cubes with the bulgur and cook until tender. Or, roast ahead of time and toss in with the beans. Spices: Occasionally I’ll add a teaspoon or so of chipotle powder in place of the smoked paprika. As a result, it adds just a bit of smokiness and a slight kick. Toppings: Less of a variation and more of a must: chopped onions, parsley or cilantro, greek yogurt, cheese, and if I’m making chili for my husband and I, hot sauce. Most bulgur is sold with no choice of variety but there are golden and red varieties (made from the different varieties of wheat- red and white). Tabbouleh: traditional or a nice spring variation. Fritters: Bulgur and Spinach with Eggs and Tomato Chutney. Wow, I’m really intrigued by the dark chocolate! I can see how this could be very big on flavour and work well. Looking forward to giving it a try. Can’t wait to try this! It looks so hearty and delicious – perfect for winter. This chili looks absolutely amazing. I wish I could have tomatoes because this really looks delicious! Rae, you could always substitute a high quality “red sauce” (enchilada sauce), just check the ingredient list. Or pureed roasted red peppers! Love this recipe. Was just thinking I needed to make a vegetarian chili and now I’m definitely leaning towards using bulgur as the base! This looks and sounds amazing. 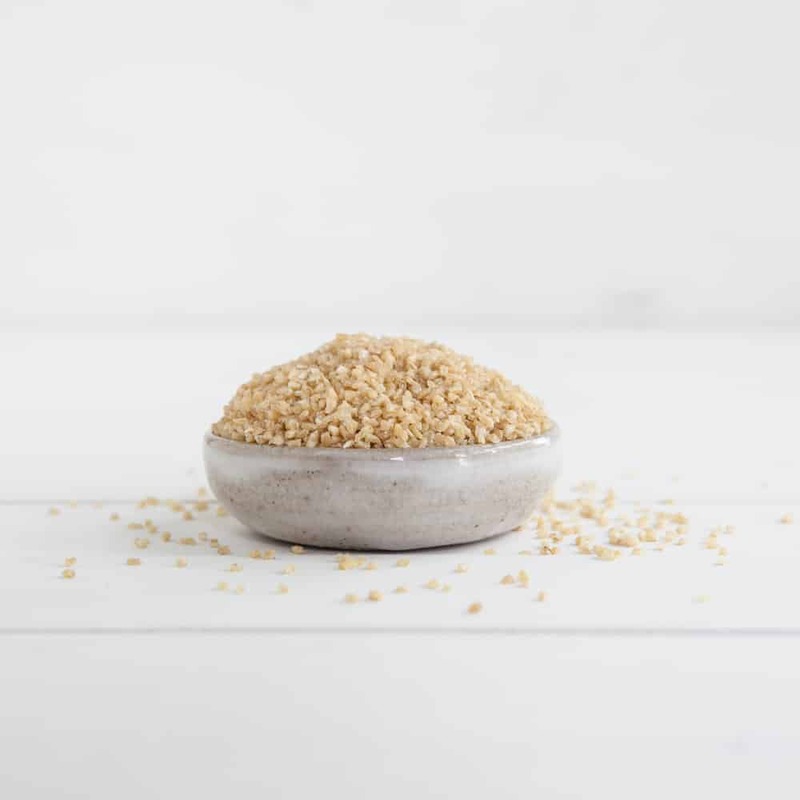 I love the texture that whole grains like bulgur (and pseudo-grains like buckwheat and quinoa) add to well…anything! I’m looking forward to introducing my German boyfriend to some of your good home cooked chili.Thanks so much! This looks so hearty and tasty! And I love the chocolate in there! I just made this — it’s delicious! It reminds me of mole sauce. And I love the texture. I usually make a chunkier chili and I think I now prefer this kind. Thanks for another great recipe! I just made this and it was delicious. Actually, I didn’t make *this* because it’s spring in the southern hemisphere and parsnips are out of season, oh and I didn’t have any bulgur. I substituted and made this recipe using cauliflower and carrot with freekeh. It was great and I will definitely be making it again. Thanks. What an amazing dish. I have made it two days back with the same recipy which you have shared It was delicious , divine and mind blowing. What a texture it had I tried it first time, thanks to you only. I’ve made this recipe twice now and am making it again this weekend for my football watching friends. It is absolutely divine. I LOVED this recipe. The bulgur gave it such a nice hearty outcome. This is my second week in a row making it and some of my kids even tried it this week although I subbed in black beans for them b/c they love them. Great recipe to double and freeze like you said. So good with cilantro and pumpkin seeds sprinkled on top! Thanks so much!! Thank you for a great recipe! I’m adding this to my “go-to” collection. The combination of the chili and chocolate is what makes this recipe! After reading your notes, I decieded to add sweet potato for a bit more substance. I also did a fine dice (by hand) rather than food process everything–chalk it up to laziness, but I didn’t want to clean my food processor. Hah! 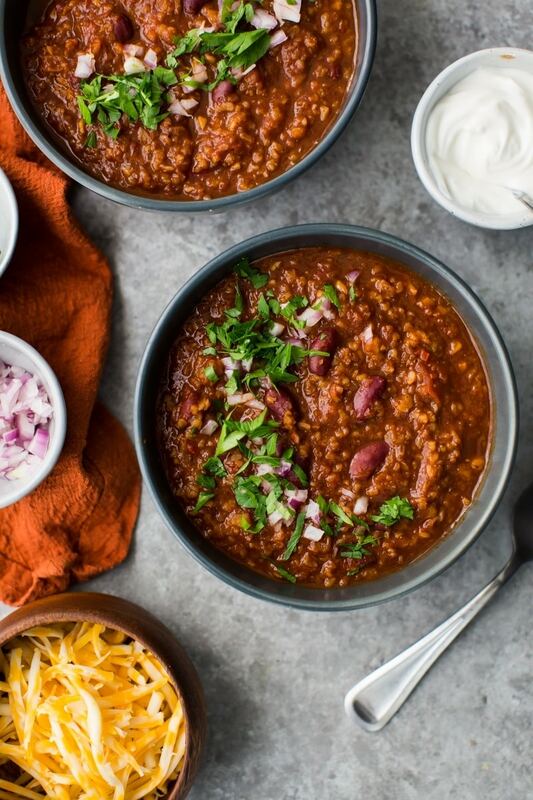 Thanks again–such a great alternative to the traditional veggie chili recipes out there. This recipe looks amazing, I’m really really interested in how the chocolate mixes with the spices, and I’ve never had Bulgur before so this will be a first. 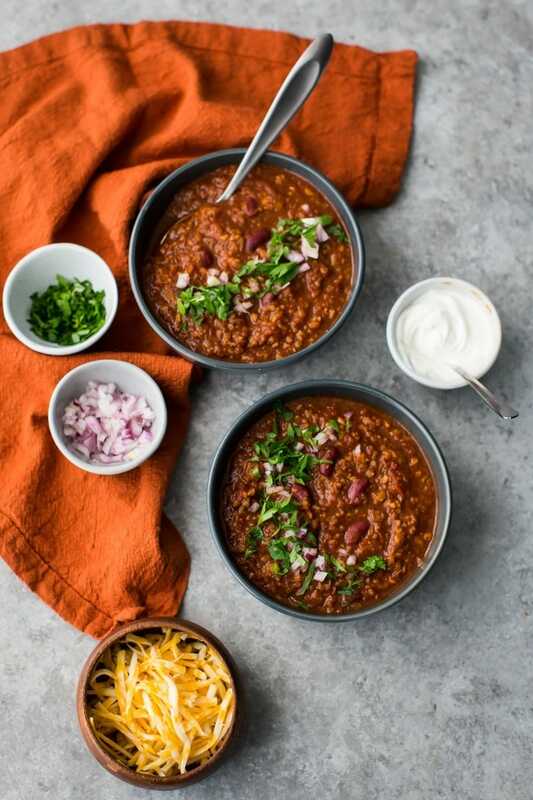 I love that you recommended to put greek yogurt on your chili, I do that too but all of my friends think its weird, and I’m like you guys are missing out! Made this over the weekend as a daddy-daughter cooking exercise, this chili was amazing. 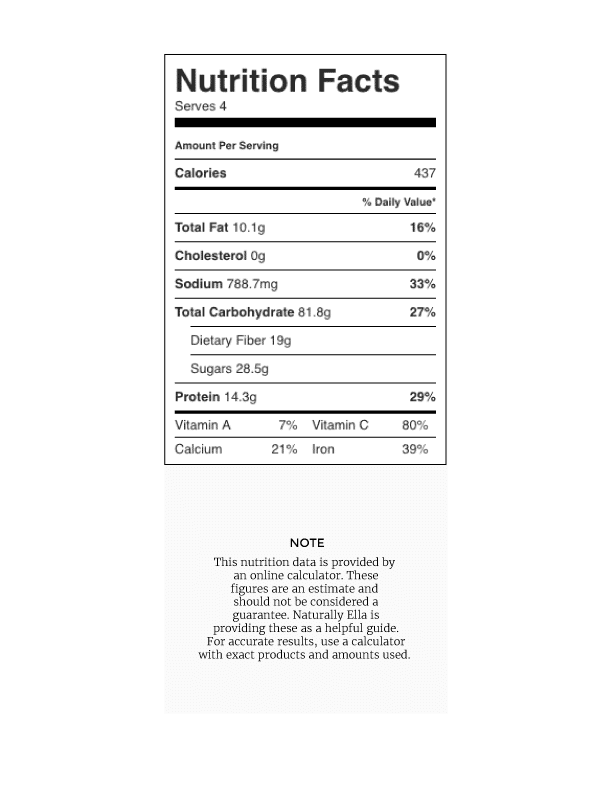 I’m trying to get my kids on the health kick early on as opposed to feeding them mcdonalds, so I love blogs like this where I can get heart healthy food recipes to try all the time! Made this last night and it turned out great! My husband, who was skeptical of the bulger, said it was a great meat substitute, and my six year old requested it for her lunch today. I made a few adjustments based on what I had in the house – swapped carrots for parsnip, omitted the smoked paprika, and just did 1 ounce of bittersweet chocolate. Will definitely make it again – thank you! Can leeks be used instead of parsnips, or are they too bitter? I wouldn’t use them instead, but you could add them. If you’re looking to replace parsnips, I’d go with carrots or just leave them out! Hi – you used to have a vegan chilli up on here too, but the link redirects to this recipe now! I really loved that recipe, is there any chance you could fix the link? Made this for my lunches this week and it came out great. I did make some adjustments to suite my needs. I used closer to 2 cups of water since I like a thicker consistency, added some tvp (yves orginal), omitted the parsnip and used 2 tsp of chili powder since I don’t like it too spicy. Made 3 LARGE portions at 560 calories each. Very tasty and filling. I made this today, even though it’s the wrong time of year for chili, and I am so impressed by your recipe! It is delicious! After becoming vegetarian, I’ve struggled to replace my meat recipe & have tried several recipes, including my old recipe, just substituting veggie crumbles. This is, by far, the best results I’ve gotten! Thanks so much for the recipe and tips. I may use your tip to increase the spice a bit, but it’s a great chili as it’s written. I didn’t have access to parsnips, so I used a carrot. Thanks again for your recipe. I know I will really enjoy it this fall and winter. Went double on the tinned toms… reckon that was a good idea too. Second time making this and it is definitely a hit! Added butternut squash and omitted the parsnip. Thanks so much! If i wanted to replace the chocolate pieces with cocoa powder, how much do you think might be the right amount? This looks delicious, I love the addition of bulgur! I’d start with 2 tablespoons and add more if needed! A great recipe. Cook a couple of days in advance and the flavours for a real taste bud treat!